This was first published by the American University of Central Asia. Permission to publish on the SVRI Blog was given by the authors. As we take part in the 16 Days of Activism Against Gender-Based Violence campaign over the coming weeks we couldn’t be more excited about sharing an update than this one. This application is part of the SVRI and World Bank Group’s Development Marketplace for Innovation on Gender Based Violence award funded project ‘Combatting Sexual Violence in Kyrgyzstan through Innovative Education and Information Technology.’ A big part of our project is to find innovative ways to address gender-based violence in Kyrgyzstan through technology. From October 20th to 22nd 2017, we partnered with a group of AUCA students who form the group Neobis to take part in a Hackathon at AUCA. Hackathons are held worldwide, and bring together programmers and software engineers to come up with creative solutions to various social problems. Fifteen teams from throughout Bishkek took part in the event, with roughly 100 participants overall. The Hackathon’s theme was ‘A safe city and a safe environment’, and sought to specifically address gender-based violence. We couldn’t have asked for a more relevant topic for our project. Our team developed an application designed to provide survivors of sexual violence with information and fast access to emergency services. The program was developed by a multi-disciplined team of coders, programmers and designers, as well as a senior anthropology students to address the social and cultural aspects of sexual violence. 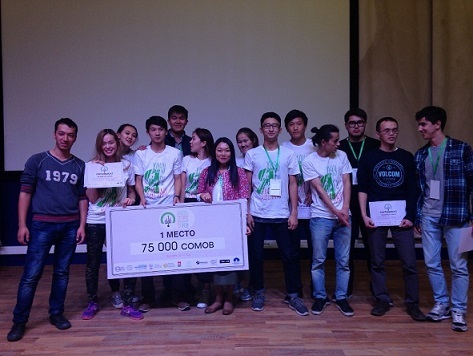 Coming first in the Hackathon is both an honor as well as a statement about the strength of the project more broadly. It reaffirms our commitment to addressing and combatting sexual violence in Kyrgyzstan, and emphasizes the way that innovative technology can provide unique and important solutions to these issues. Furthermore, this victory will drive the project forward, and has provided us with a working application to continue developing. As we move forward we will build on achievements made during the Hackathon to advance the project in a variety of ways. We would like to thank all of the judges, mentors, experts, and organizers of the Hackathon, and most importantly our team members. The team: Mamadnazar Shohkarimi, Bektursun Tagaev, Mukhamed Khasanza, Aidai Kazybekova and Sanira Madzhikova.